It's easy to forget about the poor sweet potato in between the holidays and, even then, to only think of them smothered in brown sugar and marshmallows. But in reality these tantalizing little tubers make for a delicious, easy dinner that is surprisingly healthy any time of year. 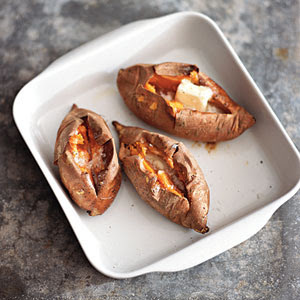 Sweet potatoes are high in Vitamins A and C and Beta Carotene (hence the orange color), and, if you eat the skin (which you should because it's tasty) full of fiber, to boot. In fact, they were ranked highest nutritionally among all vegetables by nutritionists at the Center for Science in the Public Interest (sorry, Popeye). You need little to no cooking skills to make them- all you do is preheat the oven to 400, scrub the sweet potatoes under running water and pierce them with a fork a few times. Pop them in the oven on a baking pan (or even just a piece of tinfoil) for 40-60 minutes (depending on their size) and voila! Dinner is served. For accompaniment, slice them open and sprinkle with coarse salt and pepper, and (if you feel like it) a dollop of butter or sour cream. Or do what I do and pour a little orange juice over them, and top with caramelized onions. Just be prepared to die from deliciousness-overload. I love to actually season the skin with olive oil salt and pepper before I pop them in the oven. It makes the outer parts crispy and delicious! And if you're really lazy, like I am, you can just microwave them. Lil-major point you forgot to mention...they are seriously lo-cal. Good point! They are only 120-160 calories a pop (depending on their size-duh). Not to get all Weight Watchers-y on you. How long do you microwave them for?